Cathy Bame, a Van Dyke Church volunteer tutor, congratulates a kindergartner on a job well done. Volunteers say tutoring at local schools is a rewarding ministry for young and old alike. Photo from At-Risk Kids Ministries. They may not wear halos or wings, but as far as Dover Elementary School teacher Ninfa Guerra Rodriguez is concerned, the tutors from St. Andrew’s UMC, Brandon, are the next best thing to angels. St. Andrew’s is one of many churches in the Florida Conference that provide tutoring services to public school children from diverse, disadvantaged backgrounds. Some ministries, like the after-school program founded by Branches UMC, Florida City, have operated for decades; others started in the past year. Across Florida, language skills tend to be a major hurdle for children of immigrants struggling to learn. Other children who grow up speaking English are hampered by poverty and even homelessness. About seven years ago, St. Andrew’s member Nancy Plate recognized a need for tutoring at Dover after visiting a migrant farm worker camp. She spearheaded a ministry that currently provides nearly a dozen volunteers a week to the school. The volunteers offer reading and math help to children of migrant farm workers who travel to eastern Hillsborough County each fall to pick strawberries and citrus. “Our school is 75 percent migrant, the largest percentage in the county,” said school social worker Ang Sanchez. 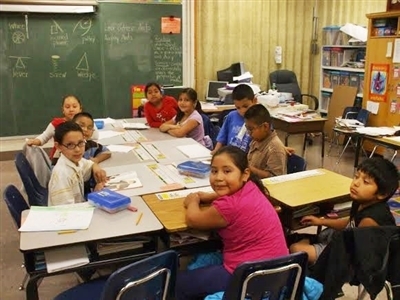 The language barrier and transitive lifestyle make learning difficult in a traditional public school environment, Sanchez said, but one-on-one weekly tutoring sessions provide a tremendous help. With a high number of children of migrant farm workers who speak little English, Dover Elementary teachers say volunteer tutors from St. Andrew's UMC, Brandon, lead to measurable student test score improvements and immeasurable gifts of hope. Photo from St. Andrew's UMC. The entire St. Andrew’s congregation has embraced the school’s migrant children, providing them with food, blankets, toys and other items. Each year, the church sponsors a Christmas gift drive and then hosts a party where Santa hands them out to the children. Elsewhere in Hillsborough, members of Van Dyke Church, Lutz, have answered a call for tutors at a North Tampa school where 50 third-graders failed to meet state educational standards. “Ninety-eight percent of the children at Mort Elementary School meet the income eligibility guidelines to receive free or reduced-cost lunches,” said Zenia Robertson, who leads tutoring efforts for Van Dyke’s At-Risk Kids Ministries. In July, At-Risk Kids director Cheryl Jackson began recruiting volunteer tutors. Within six months, Van Dyke was supplying 95 a week, including many who fit their volunteer work in around full-time work schedules. Church members also provide backpacks with food for 50 children every week, collect toys and help with the school’s annual fall festival. While the churches in Hillsborough focus largely on the farm worker population, Grace UMC, Lake Mary, in Central Florida’s Seminole County has zeroed in on the region’s growing number of homeless children. 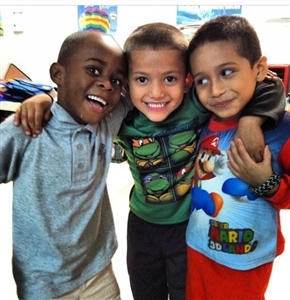 Tutoring at Lake Mary Elementary led to discovering other needs of homeless children. Pictured, left to right, are Rev. David Juliano, Grace UMC pastor; school principal Tina Benitez; Christine Peacock; and Ladye Cox, president of the Dividends UMW group, showing some of the uniforms donated by church members. Photo from Grace UMC, Lake Mary. “I saw a television program on the county’s homeless population and asked the vice principal at Lake Mary Elementary School to speak to us about the challenges the school faces in dealing with the homeless,” said Ladye Cox, who heads the volunteer tutoring effort through the church’s United Methodist Women’s group, Dividends. Cox said the biggest hurdle these children face isn’t a language barrier but the inability to find a place outside school to study. Some struggle to stay alert in class because their living conditions prevent adequate sleep and nutrition. “You have students who are trying to study in cars or in overcrowded homes with a lot of activity that makes it difficult for them to concentrate on homework,” Cox said. To keep these children on track, two Grace volunteers help fourth-graders before school every day, while others work with first-graders individually during school hours. The women’s group also bought school uniforms, socks and underwear for children receiving tutoring and set up a fund to help with school supplies, field trip money and shoes. The need for volunteer tutors is nothing new. Far to the south, a ministry founded 40 years ago by Branches UMC, Florida City, has provided tutoring, homework help, healthy meals and enrichment activities for low-income and immigrant children in Florida City, South Miami, North Miami and Pompano Beach. Haitian and Hispanic children, above, find help at United Methodist-founded Branches, a South Florida ministry that helps them overcome language barriers. 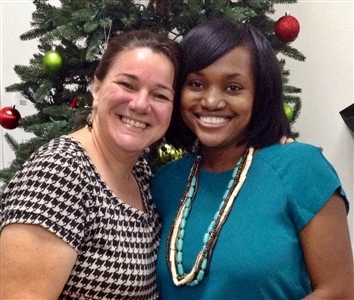 Below, Martine Marcelin, right, credits Branches and her mentor, Kim King Torres, with changing her life. Photos from Branches. More than 250 schools from elementary to high school receive volunteer tutors through Branches, which also offers college preparation and GED classes, community service projects, immigration clinics and sports teams. Kim King Torres, Branches student services director, believes these programs helped contribute to Florida City’s 90 percent graduation rate. Heading up a Branches program at Lakeview Elementary in North Miami is a past beneficiary of the ministry, Martine Marcelin. When Marcelin was 5, she and her mother made the perilous journey from Haiti to the U.S. in a small boat. Once settled in Florida City, the child struggled to fit in and catch up academically while her mother worked long hours as a hotel maid. Marcelin still recalls the pain she experienced in first grade when classmates teased her about her heavy accent. Then Branches became her home away from home. “It gave me a sense of belonging somewhere, a family and a lot of morals,” Marcelin said. With the help of after-school tutors, she became an outstanding student and eventually received a full scholarship to Florida Southern College, graduating in 2009. She now has the opportunity to inspire other disadvantaged youngsters. “When I see these little kids who have been living in the United States for a year or two, I see myself,” she said. At Dover Elementary to the north, Methodist volunteers also enjoy changing lives for the better. -- D'Ann Lawrence White is a freelance writer from the Brandon area.